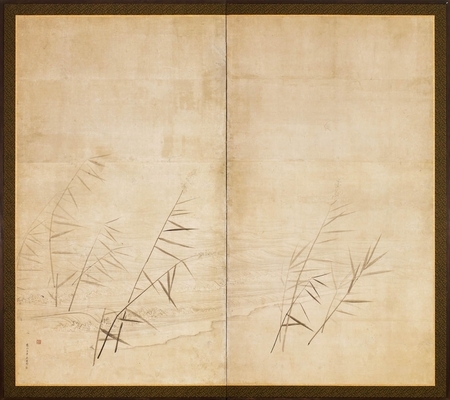 6631 A two-fold paper screen painted in ink and colour on a buff ground with a lake and ashi (reeds). Maruyama Ōkyo (1733-1795), gō (art names): Isshō, Kaiun, Kaun, Ōsui Gyofu, Rakuyō Sanjin Seishūkan, Senrei, Sensai Settei, Untei. Given the name Maruyama Masataka, he was the son of a farming family in Ano-o, in present-day Kameoka. He moved to Kyoto as a teenager where he worked as a shop boy for a clothing retailer before getting a job painting the faces of dolls at the Owariya toy shop where his talent was recognised, giving him the opportunity to enter the Kanō school. He started his formal studies under the Kanō master Ishida Yūtei (1721-1786). 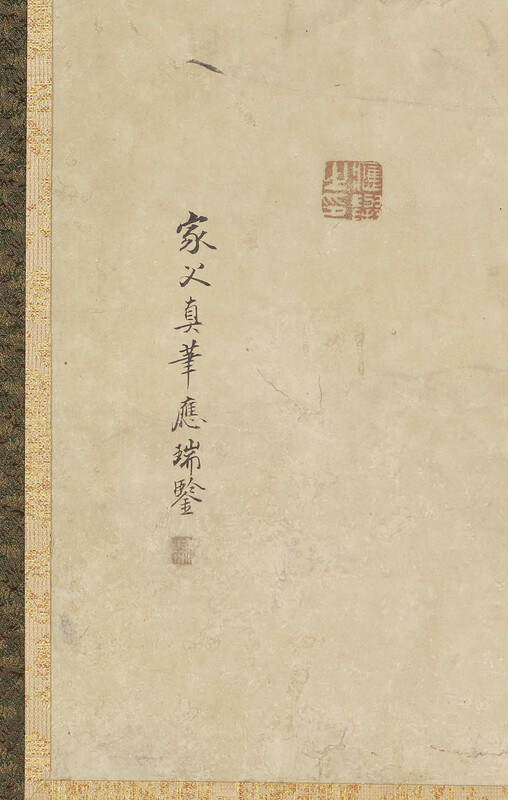 Ōkyo was later patronised by Yūjō, head of the Emman-in, Ōtsu, and from 1765-1775 he was able to study the monastery’s collection of ancient paintings. In 1766 he took the name Ōkyo. Ōkyo first became acquainted with Western perspective when he saw a European stereoscope and in 1767 he tried his hand at one of the images and created Harbour View, a small picture in single-point perspective. Ōkyo soon mastered the techniques of drawing megane-e (eyeglass pictures) and incorporated this in what eventually became his personal style of Western naturalism mixed with Eastern decorative design. Success prompted Ōkyo to start his own school in Kyoto, where he could teach his new style. A talented teacher, he soon took on many students and taught them to rely on nature to render images in a realistic manner using light, shadow and form. The school grew in popularity, and branches soon appeared in other locations, including Osaka. Much of the school’s work is today preserved at Daijō-ji, a temple in Kasumi (Hyōgo Prefecture). Noteworthy pupils include Ōkyo’s son, Maruyama Ōzui (1766-1829), Nagasawa Rosetsu (1754-1799), and Matsumura Goshun (1752-1811). 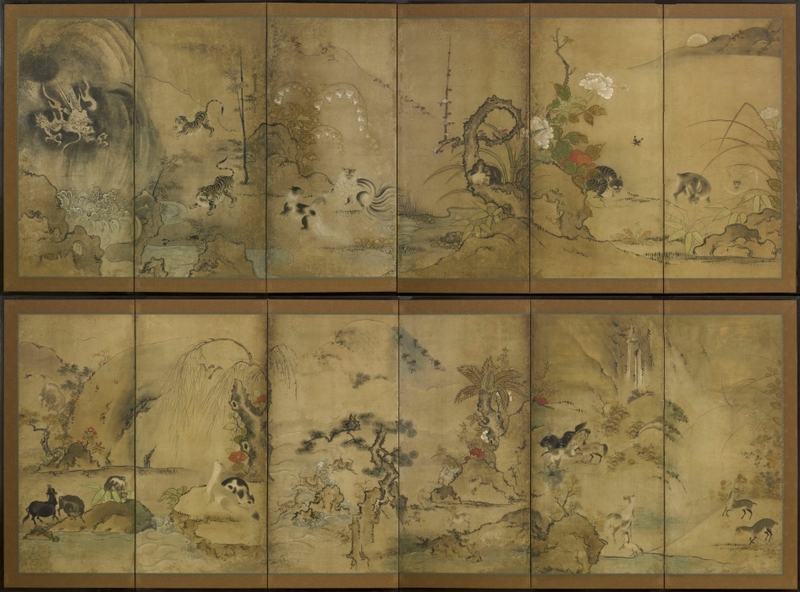 Goshun joined Ōkyo’s school in 1787, later that year the Maruyama school was commissioned to paint screens for Daijō-ji. In the same year, Kyoto suffered a devastating fire forcing Ōkyo and Goshun to move into Kiun-in temple. The two became great friends, and Ōkyo refused to regard their relationship as that of teacher and student. Goshun later went on to found the Shijō school. Maruyama Ōzui (1766-1829) was Ōkyo’s eldest son and succeeded him as the leader of the Maruyama School. Works by the artist can be found in the collections of: Cincinnati Art Museum, Ohio; Daijō-ji, Fukuoka; Emman-in, Otsu; Freer Gallery of Art, Washington; Los Angeles County Museum of Art, California; Metropolitan Museum of Art, New York; Tokyo National Museum, Tokyo. SKU: 6631. Categories: Screens, Two Fold.